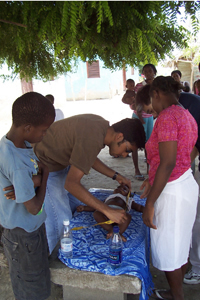 Pritzker School of Medicine student Rohit Puranik (center) helps conduct a toddler’s health assessment in a village outside of the southern costal province Barahona. Students from the University’s Pritzker School of Medicine recently received the first Outstanding REMEDY Program Award for service in medicine during a public health trip to the Dominican Republic, one of the poorest countries in the western hemisphere. The award will be presented in April at the inaugural REMEDY Global Impact Awards ceremony. The Yale School of Medicine, which administers the nationwide program—called REMEDY, for Recovered Medical Equipment for the Developing World—selected the Pritzker team from more than 600 programs nationwide. REMEDY sends medical supplies to developing countries throughout the world to address critical health care needs while reducing the amount of U.S. solid medical waste, such as a surplus of syringes. Since its inception, the University REMEDY has been lauded as one of the best programs in the country for a variety of reasons, said Tammy Young, executive director of REMEDY Inc.
Chicago students pose for a photograph with mothers and their children. Each year, leadership of the Pritzker REMEDY torch is passed to incoming first-year students. 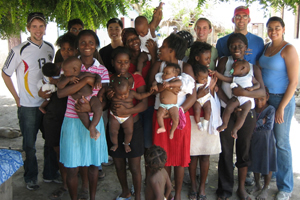 During the summer of 2007, the REMEDY UChicago team scheduled a two-week visit to set up health clinics in the Dominican Republic. The 23 medical students, as well as three University undergraduates, partnered with several urban hospitals in the Dominican Republic and three non-profit organizations to provide care in their service communities. Working with Minal Giri, a Chicago-based pediatrician and Pritzker alumnus, the first-year students helped treat more than 100 children with bacterial infections, scabies, worms and scleroderma, a skin disease. They also helped assess the health of new mothers and their babies at a settlement for sugarcane workers outside the southern coastal province Barahona. The students support a different mission project each year. Chicago’s REMEDY program not only collects medical supplies, they also go to a developing country for hands-on interaction with the local community. REMEDY UChicago collected more than $35,000 for the effort, raising funds by auctioning outings with medical school professors to restaurants and sporting events, including a round of golf. The group’s speed-dating fundraiser at the University’s Graduate School of Business attracted hundreds of graduate students. With the money they raised, the students purchased more than a ton of supplies, including an EKG machine and medicines, such as antibiotics and anti-parasitics, for communities in the Dominican Republic. They also received donated supplies from the University Medical Center, particularly the pediatric intensive-care unit and Pari Respiratory Equipment Inc.